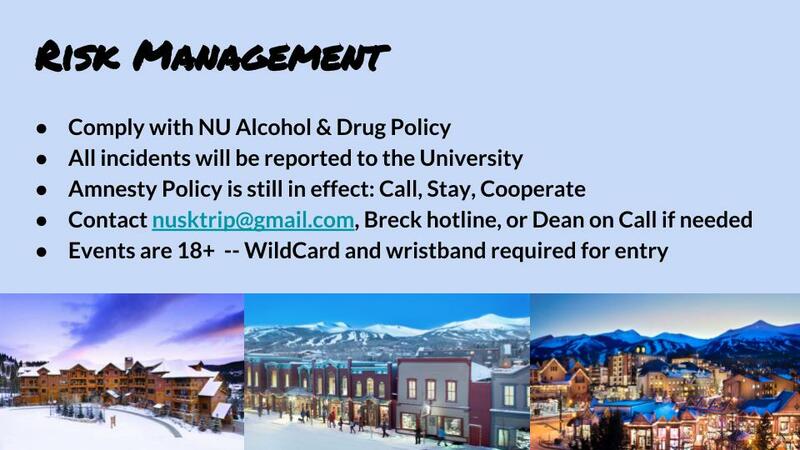 "Blame it on the Altitude"
Keystone, CO was a blast for each and every Northwestern student due to the great accommodations, amazing skiing options and fun-filled social venues. With NU Ski Trip accounting for approximately 90% of the Keystone Villages' lodging, the village became a mini-Northwestern. Due to Keystone being a Vail Resort, students could use free shuttles to ski at A-Basin, Vail, and Breckenridge for no additional charge. The trip was topped off with an NU DJ Bar Crawl, a White Out Party, and a concert featuring Chingy! Check out our hype-up video prior to the trip. NU Ski Trip 2012: Steamboat Springs, CO.
NU Ski Trip 2012 was a helluva lot of fun due to some amazing snow and several unique activities. Steamboat Resort is one of the best mountains in Colorado, and the skiing and natural hot springs did not disappoint. Bubba Sparxxx headlined the concert, and the Ugly Sweater Party at the top of the mountain showed that no matter what level of skier you are, the top of the mountain is the best place to start getting down. "Can We Get Much Higher? Park City, UT is considered one of the best places to ski in the US, and Northwestern Ski Trip had to show Northwestern students why it's so famous. The classic Ugly Sweater Party was a hit with students, and the day trip to Snowbird did not disappoint avid skiers. Finally, Baby Bash put on quite a show for us at the concert! Students took control this trip, transplanting the shenanigans of Evanston to the mountain resort. Not only did the Ying-Yang twins perform, but ski patrol opened up Revolution Bowl the first time that season. Everyone was waist deep (and face first) in the powder. For those kiddos more interested in chilling than being chilled, hot tub party machines and all you can eat sushi provided plenty of entertainment. "No Friends on Powder Days"